2011 Josh Wise #7 TaxSlayer.com / Chevrolet Impala NASCAR diecast, by Action. 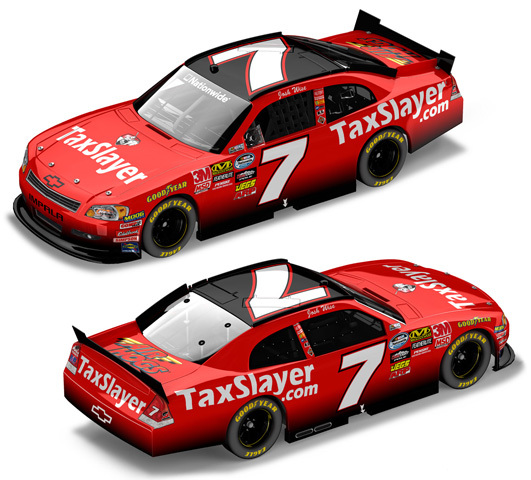 The JR Motorsports #7 TaxSlayer.com Chevrolet was driven by Josh Wise in 6 races during the 2011 NASCAR Nationwide Series season. 2011 Josh Wise #7 Air Hogs / Chevrolet Impala NASCAR diecast, by Action. The JR Motorsports #7 Air Hogs Chevrolet was driven by Josh Wise in select races during the 2011 NASCAR Nationwide Series season. Autographed - This diecast car was autographed by Josh Wise, on the windshield in Silver. Includes an Action Racing Collectables certificate of authenticity and JR Motorsports hologram. 2010 Josh Wise #7 Lionel NASCAR Collectables / Chevrolet Impala NASCAR diecast, by Action. 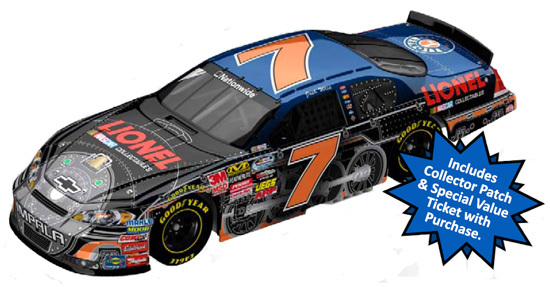 The JR Motorsports #7 Lionel NASCAR Collectables Chevrolet will be driven by Josh Wise in the NASCAR Nationwide Series, Kansas Lottery 300 at Kansas Speedway on October 2, 2010. The 1:64 version does not include a collector patch and ticket.